The Wallbarz Family gymnastics set is especially designed to support the child development, the coordination as well as the motor skills. Physical activity on the Family gymnastics set can help your child to gain more confidence, to become more independent or more creative. 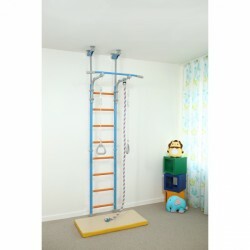 The climbing frame Family includes a rung ladder, height-adjustable gymnastics rings, a climbing rope, and a chin-up bar. The chin-up bar can be individually adjusted in height. That's how the Family gymnastics set grows with your child and remains a loyal playing partner for many years to come. The Wallbarz Family gymnastics set is very sturdy, stable, and can be loaded up to 100 kg. Hence, several children can practise gymnastics with the Wallbarz climbing set or you can do some training together with your child. The assembly is quite easy and the required space is less than 0.5 square metres. Wallbarz offers to possibilities of mounting. The gymnastics set can be spread between the floor and the ceiling without drilling or be mounted on the wall. Highest safety requirements have been taken into account with respect to the production of the Wallbarz Family gymnastics set. The Family gymnastics set corresponds to all applicable safety standards. Meine Kinder ( 3 und 6 Jahre) sind begeistert. Sehr stabile Sprossenwand.Die Puzzle-Matte haben wir auch dazu gekauft. Würde jedem weiterempfehlen. Wallbarz puzzle mat Subito disponibile!